Ridley Scott will have produced 2 movies that will have marked my turbulent life of young teenager; Blade Runner and Legend. Two wonderful movies which have a point in common; some very beautiful electronic music filled by deep ambiences. But at each time, a music which has caused quite an imbroglio among fans. Legend is the story of a young and beautiful princess who is desired by the good, embodied by the innocence, and the strengths of evil, embodied by a powerful Minotaur, who tries above all to corrupt the beauty by killing these two unicorns. It's a magnificent fairy tale that Tangerine Dream embellishes even more with a music which espouses to perfection both the story and its images. Initially the music was suppose to be the one of Jerry Goldsmith but the thinkers and decision-makers of the Universal Studios have asked for a younger, a more modern music. Two versions were going to see the light of day; the one of TD, for the purpose of the Canadian and American markets, and the rest of the planet would have the music of Jerry Goldsmith. 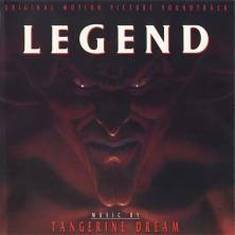 Beyond this artistic confusion, “Legend” is the last real album of the Dream with Johannes Schmoelling on board. And to me, it's the kind of music that, placed above the superb movie images, has an unforgettable effect for the rest of your life, as with Blade Runner but with a clearly more poetic approach. After a pop song track, at the height of Bryan Ferry's repertoire, the magic of Tangerine Dream and of their music with the aromas of fantastic tales is invading our eardrums. "Opening" opens with an incisive flute and its breezes of medieval poetries which float in a scheming ambience. Strata and choirs are rocking these dark breaths of which the brief harmonies cut through our eardrums with charming breezes that will haunt our ears throughout the opus. "Cottage" is a sublime enchanting lullaby where the beauty and the blackness live in a Mephistophelian ballet. The tune, seasoned by what sounds like a splendid Arpeggiator, seems to have inspired Franke and Froese for Alchemy of the Heart on Tyger. This is a great track which charms from the first listening, quite as "Unicorn Theme" whose oniric structure will serve as springboard to "Loved by the Sun". This melodic virginal structure is the heart of a music which glitters to wonder the mythical and romantic atmospheres of this medieval period. The track is diving into a distressing mood with magic percussions, sequences to tones of woods and orchestrations which weave a crazy race through an enchanting forest and the dens of its madness. This race continues with "Goblins" and its tenebrous bad patch where a strong Mephistophelian scent reigns. "Fairies" continues to crumble this cacophonous rhythmic running before espousing the harmonies of a surprising nursery rhyme for black magic with a beautiful duel of Mellotron's gasps which sing in bewitched dusts. Jon Anderson shows all the magic of his voice by being one of the few to be able to sing and follow over the Dream Mandarine eclectic music of. His voice on "Loved by the Sun", stemming out from the wonderful part of "Unicorn Theme", is sublime. And when voices of Elf recite; “Sweet songs of youth, the wise, the meeting of all wisdom” and “to believe in the good in man”, the sweat goes wild all over our backbone, demonstrating the ultimate goal of a magical music over all of these stunning movie scenes. Each track is flooded by this key mood which enacts the feelings on superb images. So "Blue Room" spreads its carpet of dark ambience where are floating choirs in redemption and synth lines to strident hooting lost into a forest of thousand diabolical mysteries while that "The Dance" is all its opposite with a youthful mood. It's a so splendid ballad of a medieval folklore where the virginal princess dances and dances in exhilarating harmonies. The breath of the Beast in the back of his neck, she gives up her innocence through this wonderful spherical waltz skillfully designed by the Berlin trio. With its black choruses and their guttural breaths, "Darkness", the name of the Beast, is also schemer and disturbing than "Blue Room" but with a clearly inspiring devilish touch. It's a track dark of moods which ends in the hammerings of percussions and cloud of fluty breaths. "The Kitchen/Unicorn Theme Reprise" ends “Legend” with nervous breezes which tremble in an infernal whirlwind where percussions and sequences weave the bases of a rhythm which stamps heavily in the phases of apocalypse that the guitar of Froese bites of vindictive solos before sinking into the comforting sweetnesses of "Unicorn Theme" and of its melodic phase fills by some virginal puffs of breaths. Ending so a wonderful music for film. A film which I’m sure wouldn't have all the success that it has got. “Legend” is a magical soundtrack which adds a poetic depth to a fantastic work. And to pay tribute in this music, which returns so well the schemer ambiences of this movie, a DVD version offers the possibility of hearing the music of the Dream on images amputated of any dialogues, so measuring the impact of this small masterpiece of film music where the images take all of their senses through these soft moods as deeply oniric as viciously mephistophelic. I saw the movie with Jerry Goldsmith's music and the impact on emotions (you know, these small goose pimples raising over our spinal) has never equalled the one of Tangerine Dream. And on the other hand, I listen to the music without the images and I always have these small shivers of anxiety which run on the backbone of my emotions. It's a magical and a dark album which contains passages of an extreme beauty. It's a journey in the perverse beauties of a bloodcurdling abyss.